Rose and her eleven sisters must dance each night for the King Under Stone. 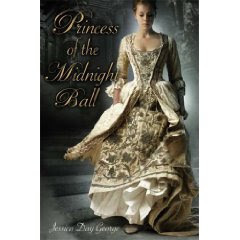 Based on a Grimms fairy tale, Princess of the Midnight ball tells the story of 12 princesses who are under a curse. Worn slippers every night is a mystery to their father, the king. Galen is a young soldier turned gardener who falls for Rose and seeks to find a way to break the spell. I am not familiar with the original tale, but loved this story. Galen is a brave and kind man who knits. With his knitting and a unique source of magic, Galen sets off to fight King Under Stone. I enjoyed how each sister had a unique personality and despite being under a curse and unable to break it, they are feisty and spirited. I have enjoyed this author's novels and highly recommend them. What is the original fairy tale? I dont' recognize it. Yes, it's the 12 Dancing Princesses. I'm not familiar with it either so it was nice to read it without knowing the story. Thanks! It is The Twelve Dancing Princesses, although in the original Grimms' collections it's usually called something completely generic like The Princesses and the Shoes or The Princesses Who Danced. I actually grew up with the Faerie Tale Theatre movie version, starring Leslie Ann Warren and Peter Weller, then I found a beautiful picture book version by Ruth Sanderson as an adult.